Olivia Muñoz-Rojas researches on cities, culture and society from an interdisciplinary perspective, and is particularly interested in the visual and aesthetic dimensions of social and political processes. Her current research focuses on the origins, transmission and interplay of city images, the legacies of war and totalitarianism in Europe, and the aesthetics of revolutionary movements. She holds a PhD from the London School of Economics, having studied at and researched for insitutions in Spain (Universidad Complutense, CSIC, UOC, ETSAM), Sweden (Uppsala, Lund), the United Kingdom (LSE, BURA, Urban Age) and the United States (New York University, Harvard University). She has published on the topic of urban destruction and reconstruction in the Journal of War and Culture Studies and the International Journal of Iberian Studies, among others; as well as in other fields, including suburban regeneration and comparative education. She also writes for non-academic media. Currently she lives in Paris, and this is her first single-authored book. Olivia Muñoz-Rojas critically examines the wartime destruction and post-war rebuilding of three prominent sites in Madrid, Bilbao and Barcelona in the Spanish Civil War and its aftermath. Each case highlights different dimensions of the material impact of the conflict, the practical challenges of reconstruction and the symbolic uses of the two processes by the winning side. The book reveals aspects of the Spanish Civil War and the evolution of the Franco regime from an original and fruitful angle as well as more general insights into the topic of wartime destruction and post-war reconstruction of cities. The title – Ashes and Granite – aims to capture, visually and texturally, on the one hand, the damage caused by the war and, on the other, the Franco regime’s concept of the ideal Hispanic construction material. Written from an interdisciplinary perspective at the intersection of urban and political history and theory, planning and architecture, the book draws largely on unpublished archival material. Key features of the Franco regime’s rebuilding programme are considered, such as the priority given to rural reconstruction and the persistent search for a national architectural style. The case of Madrid centres on the failure of the Falange’s ambitious plans for a neo-imperial capital as illustrative of the regime’s gradual shift from state planning to privately driven urban development. The case of Bilbao focuses on the reconstruction of the bridges of the city to demonstrate how, occasionally, the regime managed to turn destruction and reconstruction into opportunities for successfully marking the beginning of what was perceived as a new era in Spain’s history. Finally, the opening of Avenida de la Catedral in Barcelona exemplifies how wartime destruction sometimes facilitated the implementation of controversial planning, acting as a catalyst for urban redevelopment. Moreover, the opening of the avenue contributed to the disclosure of the ancient Roman city-wall, allowing the regime to appropriate the ancient legacy symbolically. Restore, replace or leave in ruins? Ashes and Granite documents a little-understood side of the Spanish Civil War and its aftermath: what the war and the installation of Francoism meant to the making of cities. Through the presentation of hitherto-buried primary sources and excellent comparative visual documentation, the book is a genuine contribution to urban history. Interdisciplinary studies are still relatively uncommon in Spanish historical writing and Ashes and Granite is much to be welcomed. The relationship between official discourse and the practice of urban reconstruction in Francoist Spain that emerges from the book is arresting, and offers nuanced and innovative insights into the nature of the regime. This highly original book joins a growing subfield of scholarship on the urban aftermath of wartime bombings. While other works have highlighted memory or commemoration, Olivia Muñoz-Rojas draws on her knowledge of architecture, urban studies, and Spanish history to assess the Franco dictatorship's attempts to wed reconstruction to ideology at sites in three cities affected by Spain's Civil War (1936–39): the Montaña de Príncipe Pío in Madrid, eight bridges in Bilbao, and the Plaça Nova in Barcelona. […] Muñoz-Rojas has produced an innovative and perceptive investigation of prewar planning, wartime architectural casualties, postwar reconstruction, and the contours of dictatorship in modern Spain. Her book is a valuable addition to an emerging historiography on the aftermath of war from the viewpoints of urban reconstruction and the ideological aesthetics of dictatorships. Muñoz-Rojas’ local, micro-historic scope seems particularly suited to touch upon the surreal popular culture of modern war. Muñoz-Rojas exposes the long-term transformation processes undergone by each city [Madrid, Bilbao and Barcelona]. Thus, she provides historical context to the symbolic connotations of the sudden bombings and the seemingly endless rebuilding processes. Not only are cities treated as politically significant places, but also as the arena of the social and political struggle negotiated through the war. […] By stressing the practical continuities between building projects and contractors before and after the war, the author translates the issues and debates about modernity and dictatorship into her field. Silence and taboo may have contributed to the idea of Francoism as a time of political exception, but the truth that dictatorial aesthetics are an integral part of Spanish everyday cityscapes is an unsettling key to rediscovering what lies beneath such normality. Ashes and Granite clearly reveals the contradictory dynamics often present in post-war reconstructions and especially that of trying to draw on tradition while at the same time taking advantage of destruction to modernise. It also makes apparent a major gap that often arises between ambitious plans for reconstruction and the realities of post-war situations in which resources are limited, power balances delicate, and urgent demands numerous. Dr Muñoz-Rojas has pulled together a variety of primary resources from a wide range of municipal archives to delineate a compelling image of the post-war reconstruction of Spanish cities. […] And, through the empirical material of the three cases studied, she demonstrates how crucial the symbolic dimension was to post-war reconstruction policies: alternating between layering symbolism, accentuating selective meanings, revealing old content, or imposing new interpretations. With Ashes and Granite Dr Muñoz-Rojas offers an important contribution to writing the story of this period in Spain’s troubled past. 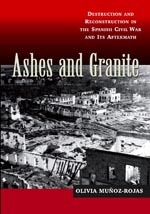 Ashes and Granite by Olivia Muñoz-Rojas is a laudable attempt to ﬁll the gap in the English-language research on rebuilding major urban centers after the Spanish Civil War. The topic is a fascinating and resonant one, as the aerial destruction of Spanish cities preceded and prepared for German and Italian aerial attacks throughout the rest of Europe; and Spanish cities started to rebuild as early as 1940, the same year in which Rotterdam, London, and Warsaw sank into ruins. […] Comparative English-language literature on the rebuilding of cities after World War II — whether held by victors or the defeated – is still very limited. Most research on rebuilding is so far available only in local languages and publications. This book thus appropriately reminds us that a true comparative and interdisciplinary analysis of postwar rebuilding – taking into account broader approaches in architectural history, urban, and planning history on rebuilding efforts, and a methodology to support it – still needs to be developed. In this short but well-illustrated study, Dr Muñoz-Rojas examines Francoist reconstruction during and after the conflict. Her focus is not rural areas –the main priority of the regime – but the cities of Madrid, Bilbao and Barcelona. She demonstrates the surprising level of continuity between pre-war and Francoist urban development plans, noting that many of the architects and engineers involved in Francoist reconstruction had well-established careers before the military rebellion of July 1936. Indeed, her book even shows that some Francoist rebuilding projects were based on contracts signed before the Civil War. […] Yet as Muñoz-Rojas makes clear, Francoist discourse emphasized that reconstruction was intended to facilitate a new postwar order; it ‘was understood as physical rebuilding, moral regeneration and economic renewal’. […] This is clearly work in progress, and one hopes that Muñoz-Rojas continues her research. What happens in the aftermath of war? Reconstruction is a term often thought of in a physical sense, but using Spain after 1939 as case studies, both of these works challenge us to delve deeper into the meaning of the term and examine its implications for propagandistic, cultural and symbolic meanings. […] Reading these two books together is a worthwhile exercise, and leaves many questions to explore. Olivia Muñoz-Rojas emphasizes the gap between rhetoric and reality, and she underlines that the Franco regime was not only “repressive” but also “lethargic” and that the visions of a new Spain fell short given these attitudes (67). Viejo-Rose, on the other hand, believes Spain serves as an excellent case to study the transformation of landscapes through reconstruction and that it allows one to draw out the symbolic narratives inherent in the process of “re-visioning the nation” (197). The two studies by Olivia Muñoz-Rojas and Dacia Viejo-Rose explore reconstruction following the Spanish Civil War from two related perspectives. One offers a viewpoint on the urban landscape and the other on what is called ‘cultural heritage’ […]. In Ashes and Granite, Muñoz-Rojas examines rather different processes of reconstruction: the renovation of war-damaged Madrid, Bilbao and Barcelona. […] The chapter on Madrid explores in interesting fashion the treatment and symbolism of the Montaña Barracks […] Reconstruction was thus political and cultural as well as material and interacted with postwar change. The false starts and wrongturns made under the Franco regime meant that processes of re-building (or, at least, modernization) were still pending even in the early 1970s.